Color chart containg material swatches for all of our Glitter HTV colors. NEW 2018 Version OUT NOW! 1/11/2019 – Can you machine embroider on this? Response From JSISigns: Yes remove the liner and our glitter can work as an Applique Glitter. 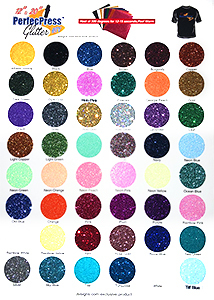 I was so delighted when I received the Glitter Color Chart. It's another great resource! From Lanette Jefferson of Compton, California on 3/1/2019 . ove the products and pricing is very reasonable. Shipping is fast. Love the color charts. Makes it easy to pick colors especially when you are choosing new colors. From Kendra of Maysville, Georgia on 2/8/2019 . Love the products and pricing is very reasonable. Shipping is fast and customer service is great. Love the color charts. Makes it easy to pick colors especially when you are choosing new colors. From Kiki Davis of Indianapolis, Indiana on 6/20/2018 .